As official suppliers of Itron in the UK, we are proud to showcase the excellent Itron Axonic ultrasonic flow meter for this month’s product spotlight. Make sure you also check out our Top Itron Meter Countdown feature, starting with the Aquadis+ Hot Water & Composite Cold Water Meter. With features specifically built for heating and cooling applications where water is used as an energy transfer medium, the Itron Axonic offers an integrated and convenient solution for district and cooling applications. The Axonic’s robust design is built to last but has one eye on existing pipe installations – Installations that use older mechanical woltman type meters won’t require any conversion thanks to the various choice of special lengths that the meter can be supplied in. As we’ve identified in past spotlights for Itron, you can be sure that the meter will provide that all-important reliance and accuracy in its reading – furthermore, the meter provides a consistent flow path and is insensitive to any flow disturbances. The Axonic offers an excellent dynamic range, ease of installation and a durable design. The ability to be easily combined with Itron calculators means that intelligent diagnostic functions are available to the operator and puts this meter at the forefront of ultrasonic heating and cooling requirements for onsite building managers and engineers. The Axonic ultrasonic meter showcases many unique features designed for easy installation, energy efficiency and communication between the operator and the meter. The universal interface allows the meter to be easily combined with Itron calculators (such as the CF51) which is extremely useful in cases of abnormal conditions such as back-flow or trapped air, where the meter alerts the operator and prompts a response. The robust and reliable nature of the Axonic meter is further enhanced by the innovative mobile flange design, insulation compliancy and various choice of lengths. This simplified installation only requires one field operator, and with an insulated pipe and extra-long neck system, the meter provides a time and energy efficient solution, ideal for on-site building managers and engineers who are looking for convenience, safe in the knowledge that their meter will run at optimum capacity for years to come. The main advantages of the system stem from its advanced functions. 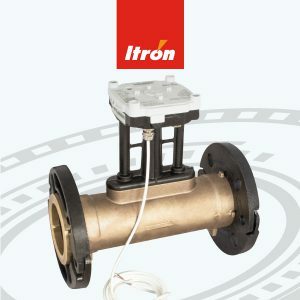 Outstanding dynamic range, highly accurate measurements and its insensitivity to flow disturbances help the Itron Axonic protect revenue and reduce losses for the end-user. By allowing connections to secondary devices such as calculators and heat control systems, the meter will operate self-diagnostic functions and even power itself, resulting in a truly optimised and intelligent thermal energy system for meeting stringent industry standards and operator requirements. Depending on the installation space, the Axion is suitable for installation in both horizontal and vertical pipe sections, with its innovative mobile flange design. As the meter is MID 2004/22/EC approved with PTB 7.2 Cooling approvals and Class 2 Accuracy to EN1434 as well, this enables installation in any part of the EU. MWA are proud suppliers of a wide variety of metering solutions, delivering in the UK within 24 hours when ordered before 4pm. Call 0121 327 7771 to learn more about how the Itron Axonic can suit your metering requirements or use our enquiry form below. You can also get in touch to ask us about specifying the right meter for any job.